Trisha Greenhalgh and colleagues wrote an opinion piece in BMJ recently lamenting (or perhaps exalting) that the EBM movement is in crisis for a variety of reasons. I don’t agree with some of the paper and I will outline in a series of posts why I disagree. When most people complain about EBM or discuss its shortcomings they usually are not basing their arguments on the current definition of EBM. They use the original definition of EBM in which EBM was defined as the conscientious, explicit, and judicious use of current best evidence in making decisions about the care of individual patients. This definition evolved to “the integration of best research evidence with clinical expertise and patient values. Our model acknowledges that patients’ preferences rather than clinicians’ preferences should be considered first whenever it is possible to do so“. 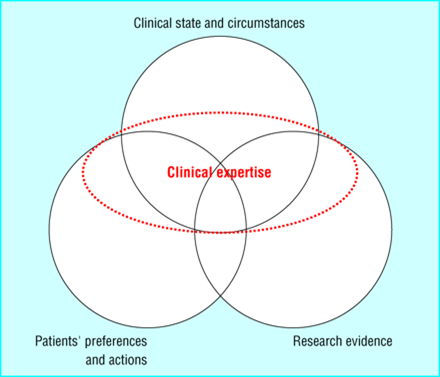 The circles in this diagram are ordered based on importance- with patient preferences and actions being most important and research evidence being the least important when practicing EBM. You can see that clinical expertise is used to tie it all together and decide on what should be done, not what could be done. Back to the Greenhalgh paper. Her first argument is that there has been distortion of the evidence brand. I agree. It seems everyone wants to add the “evidence based” moniker to their product. But she argues beyond just a labeling problem. She argues that the drug and medical device industry is determining our knowledge because they fund so many studies. Is this the fault of EBM? Or should funding agencies like the NIH and regulatory agencies like the FDA be to blame? I think the latter. Industry will always be the main funder of studying their product and they should be. They should bear the cost of getting product to market. That is their focus. To suggest they shouldn’t want to make profit is just ridiculous. 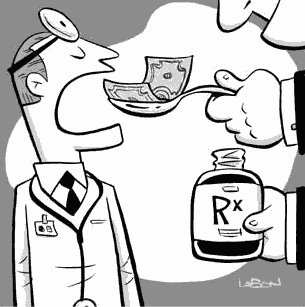 The problem arises in what the FDA (and equivalent agencies in other countries) allows pharma to do. Greenhalgh points out the gamesmanship that pharma plays when studying their drug to get the outcomes they desire. I totally agree with what she points out. Ample research proves her points. But it’s not EBM’s fault. The FDA should demand properly conducted trials with hard clinical outcomes be the standard for drug approval. Companies would do this if they had to to get drug to the market. I also blame journal editors who publish these subpar studies. Why do they? To keep advertising dollars? The FDA should also demand that any study done on a drug be registered and be freely available and published somewhere easily accessible (maybe clinical trials.gov). Those with adequate clinical and EBM skills should be able to detect when pharma is manipulating drug dosages, using surrogate endpoints, or overpowering a trial to detect clinically insignificant results. I look at this as a positive for continuing to train medical students and doctors in these skills. Research has shown that industry funded studies overestimate the benefits of their drugs by maybe 20-30%. A simple way to deal with this is to take any result from an industry funded study and to reduce it by 20-30%. If the findings remain clinically meaningful then use the drug or device. 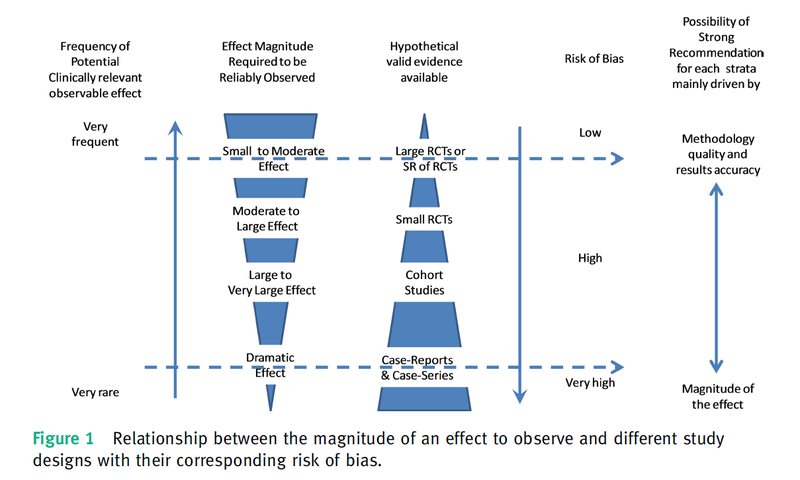 I agree with Greenhalgh that current methods to assess study biases are outdated. The Users’ Guides served their purpose but need to be redone to detect the subtle gamesmanship going on in studies. Future and current clinicians need to be trained to detect these subtle biases. Alternatively, why can’t journals have commentaries about every article similar to what BMJ Evidence Based Medicine and ACP Journal Club do. This could then be used to educate journal users on these issues and put the results of studies into perspective. Why Can’t Guideline Developers Just Do Their Job Right???? I am reviewing a manuscript about the trustworthiness of guidelines for a prominent medical journal. I have written editorials on this topic in the past (http://jama.jamanetwork.com/article.aspx?articleid=183430 and http://archinte.jamanetwork.com/article.aspx?articleid=1384244). The authors of the paper I am reviewing reviewed the recommendations made by 3 separate medical societies on the use of a certain medication for patients with atrial fibrillation. The data on this drug can be summarized as follows: little benefit, much more harm. But as you would expect these specialists recommended its use in the same sentence as other safer and more proven therapies. They basically ignored the side effects and only focused on the minimal benefits. The biggest problem though is conflicts of interest. There is intellectual COI. Monetary COI. Converting data to recommendations requires judgment and judgment involves values. Single specialty medical society guideline development panels involve the same types of doctors that have shared values. But I always wonder how much did the authors of these guidelines get from the drug companies? Are they so married to this drug that they don’t believe the data? Is it ignorance? Are they so intellectually dishonest that they only see benefits and can’t understand harm? I don’t think we will ever truly understand this process without having a proverbial fly on the wall present during guideline deliberations. Until someone demands a better job of guideline development I still consider them opinion pieces or at best consensus statements. We need to quit placing so much weight on them in quality assessment especially when some guidelines, like these, recommend harmful treatment.